Ten years ago one of the most epic Medal Races of an Olympic Games took place. It was a hard-fought battle in the Star class, primarily a match race between Great Britain and Sweden, with Brazil back in a distant third. Those three skippers – Iain Percy, Freddy Loof and Robert Scheidt – were about to play out a dramatic battle to determine the colour of the medals for their respective nations. Four years later those same legends would be re-enacting their three-way dogfight at London 2012. And now six years later those same three multiple Olympic medallists are reunited for the first time again in the Star class, for the Star Sailors League Finals in the Bahamas next month. Percy and Loof first encountered each other at the Games when competing for Finn gold at the Sydney 2000 Games. Going into the final race, Percy was top of the leaderboard, but with the Swede still in shouting distance – unfortunately for Loof the only one who had a mathematical chance of taking gold away from the Brit. Percy ruthlessly match raced Loof down the fleet to the point where Italy’s Luca Devoti was elevated to silver medal position. The Swede had to settle for bronze, while Percy stormed off with Finn gold. Eight years later and Percy and Loof were looking at another battle for gold, but this time in the Star. Percy was sailing with his great friend Andrew ‘Bart’ Simpson, Loof with Anders Ekström. Although both had already switched to the Star for the Athens 2004 Games, neither had featured in the final reckoning for medals. This time was different. However, someone who had won a gold medal four years earlier was Robert Scheidt, the Brazilian maestro who had decided to move out of the Laser – which he had dominated for a decade – into the Star. 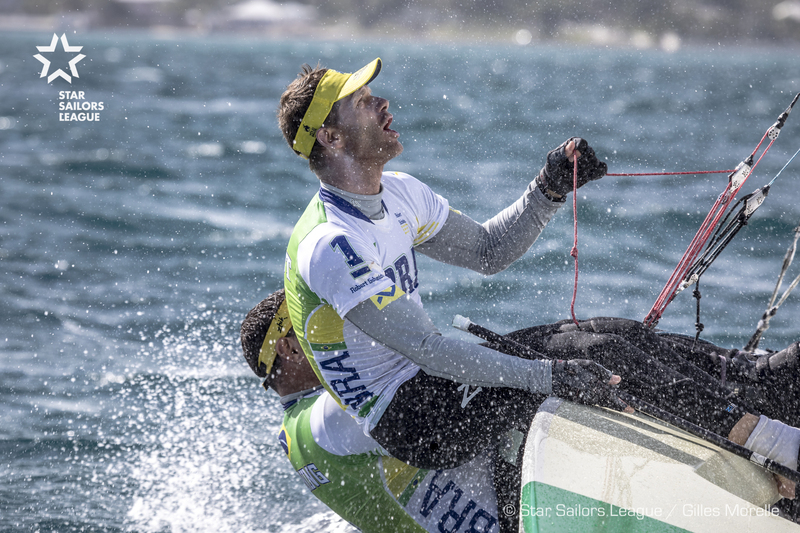 Sailing with his crew Bruno Prada, the Brazilian team had held good hopes for a medal in Qingdao but the first half of the regatta had not gone well. For the then triple medallist (two gold and one silver in the Laser), the prospect of a medal of any colour was rapidly fading. “To be honest with you, we felt a little bit out of that fight because with three races before the Medal Race, we were sitting in 8th place. We were in a lot of trouble in those Games. So we were fortunate to have a very good day on the day before the Medal Race, getting three 3rd places from three races. “Going into the Medal Race we found ourselves in third overall, although we were still far from first and second. So we were more concerned with losing third because fourth, fifth and sixth were quite close on points. We were aware of the fight between Freddy and Iain but we weren’t really concerned about it because we were focusing on our own race. When we crossed the finish line we were very happy to get that bronze medal. “When we came to the harbour, we hoisted the boat, we were already doing interviews talking about our bronze medal, and then somebody came to us and said, ‘Hey, I think you guys are silver medallists because the results have changed.’ They had messed up the results from the Medal Race on the initial set of scores on the board. It was Sweden 9 and France 10, and that, that would make us third overall. But then they revised their results and then Sweden was changed to 10 and then we got the silver medal with that change. Great news for the Brazilians, but what a bitter blow for the Swedes, particularly for Loof after Sydney, to come off worst out again out of a marginal situation. Two bronzes is not at all bad, but it was two Games where gold had slipped away for the talented Swede. The Brits focused on a match race with the Brazilians, to the point where the Swedes were able to sail their own race and mix it up with the rest of the Medal Race fleet. It was the closest possible finish across the line on a downwind finish where just a few seconds separated front to back. “We [both Percy and ourselves] had done maybe too many tacks on the last upwind leg, and suddenly we found ourselves at the wrong end of the pack. Freddy managed to just get past Hamish Pepper [the New Zealand skipper] and he won the gold.” This time the Swedes had emerged victorious from a marginal situation. Loof had found that elusive gold, relegating his Sydney nemesis, Iain Percy, to silver, and Scheidt to bronze.